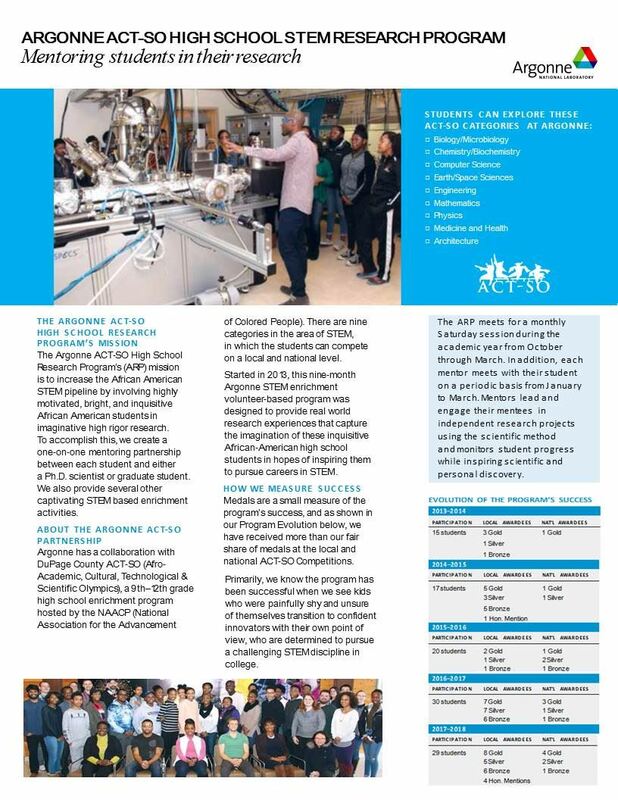 The kickoff information/orientation session for the 2018-2019 Argonne/ACT-SO STEM Research and Mentoring Program will give all potential participants and their parents/guardians an overview of the program to help them understand not only the benefits of the program, but the commitment that is required of both the student and their parent(s)/guardian(s). This program will only be open to high school DuPage County ACT-SO students who are fully registered and who have completed an in-person orientation for the DuPage County ACT-SO program. If you have not completed an in-person orientation for DuPage County ACT-SO program, you must email Dorletta.Payton@dupageact-so.org right away to request alternate arrangements. Attendance at this session for all who want to participate in this program is mandatory, so if there is any conflict that would preclude attendance for the student and their parent/guardian, an email must be sent to Argonne@dupageact-so.org by Tuesday, October 2nd, 2018, to see if other arrangements can be made. This will be the only information/orientation session for this program that will be offered. No additional students will be able to join after this date. Registration for this event closes on Monday, October 1st, 2018. Those who register MUST ALSO COMPLETE Argonne National Laboratory's Visitor Registration form via this link: https://apps.anl.gov/registration/visitors by Monday at 5:00 PM for EVERYONE OVER 16 YEARS OF AGE THAT WILL BE ATTENDING THE INFORMATION/ORIENTATION SESSION. If you do not complete the link, you WILL NOT be able to gain admission to the Argonne property. You will need the following information to complete the form: Your Argonne sponsor for the event is Gemma Cutinello (gemma@anl.gov). Non U.S. citizens should complete the Visitor Registration Form as early as possible and send an email to Dorletta.Payton@dupageact-so.org confirming that a non U.S. citizen has completed the form. Register for this event on this website.